Mail has an immense importance in our lives. Postal mail will continue to have the same importance, but it’s getting more and more difficult for us to manage it because of our busy life. We are continuously on the go, locally or even internationally, and in that case, we feel the need, more than ever, to have our mail with us. And this is where we need a digital mailbox. Now you can get your own Digital Mail Box to view and manage your postal mail and packages, 24/7 from anywhere, with a smartphone app or online! With iPostal1, the digital mail box app in partnership with Mail Central, you can manage your mail with never-before ease and convenience. This digital mailbox makes your life much easier and stress-free giving you an access to your mail from anywhere in the world. Moreover, it allows you to do multiple activities. With the digital mailbox, you need not worry anymore about your mail, bills, checks and packages piling up in an unsafe place at night or when you are not at home, have gone for work or on holidays. While you are away from your home, you can still watch all your mail online. You can also just point and click, and scan all your mail content. You can even forward mails and packages. What’s more, you can deposit checks. The digital mailbox helps increase the efficiency for business owners by expertly and reliably handling their mail and saving their time and hassle. Business owners can get their mail scanned, stored, consolidated and forwarded which greatly saves their time. Up to five members can be added to your team at no extra cost and then you can stay synced and share information. With the digital mailbox, you can send mails and packages easily anywhere in the world. 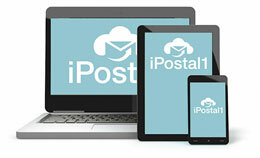 iPostal1 also allows you to choose the carrier you want. You can also choose level of service, shipping date and cost instantly online. Plus you get a huge saving on international shipping of up to 50% to 80%. You can choose topnotch shipping services like USPS, UPS, FedEx or DHL. If you are out of the USA and want to shop the products you love from there, you can shop through iPostal1 on any US website. This has another benefit that if a US website doesn’t ship internationally, you can get your shipping through iPostal1 at a much less price and within a short time. A huge amount of time is wasted in depositing checks in the bank. iPostal1 can deposit your check for you while you are abroad or in travel. Instead of your check remaining idly in a box, in an insecure place, you can hand over it to iPostal1 and get freedom from worries. Get rid of the hassle of scanning documents in your mail and backing up files. You can request iPostal1 and they do the scanning for you while backing up everything. It also allows you to upload documents and store everything in one place so as to avoid clutter and mess in your computer’s drives. Get this digital mailbox today and make your life easier!